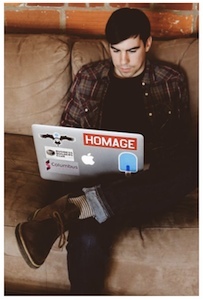 Dragging and Dropping Images From One Browser Tab to Another In AngularJS | I care, I share, I'm Nathan LeClaire. So, I catch a lot of flak for not having a Facebook. I used to have one about six years ago, when <trolling> it was actually cool, our parents weren’t on it, and we had no idea the NSA was watching our every little status update </trolling>. Then, for a variety of reasons, I deleted it. Since then, people have complained endlessly about a dearth of Nate on social media, so I have started on a new website/project called The Natewerk, which is going to be the #1 social network for people who know me. It’s written using Node.js and Angular.js, and part of the functionality that I wanted was to have the ability for users to drag an image from a separate tab and drop it into the Natewerk tab, Imgur style, taking an action appropriate for where the user was located in the app. For instance, if they were on their profile page, I want the app to automatically upload that image to the server (perhaps with a prompt to confirm, also like Imgur), so they can easily add pictures of themselves to their profile. If they were in the chatroom, it would show the image in the currently active conversation, so that people can post funny gifs/pictures and also easily post images for other people to see (this is one of the annoying things about Skype, in my opinion- you can drag and drop files but it won’t display inline, the person you’re chatting with has to download it). But neither really gave me what I wanted, which was dragging and dropping from other tabs with the body-modal kind of effect that Imgur has. So I set out to create my own. We pass in parameters here to have an eye towards reuse, although for now it is fairly geared towards the use case of a message with dots at the end (though you can use any character you want, not just '.'). display-text is the message to display. flash-char is the character to flash (it’s assumed that this character is repeated at the end of the display-text string). We pass these attributes as '@' parameters, so they will be interpreted literally. We also set the directive to stop the $interval call we are using the animate the dots in case the directive is destroyed (this prevents memory leaks / wasted resources). Not perfect, but pretty fun, and useful for our purposes. So, when the user drags an image from another tab over our application, we want the screen to be blanketed with a semi-transparent dark overlay while our message displays, and then when they drop it we want to do something with that image’s src attribute, like use it to upload the image to our server. So we have to come up with a solution to this, and preferably do it in a manner that’s idiomatic to Angular. I ended up using jQuery in my final solution to make some things a bit easier, but I’m sure there are some craft souls out there who could do everything with just the jQuery lite implementation Angular ships with. Sweet. Now we will create the create the imageDragDropUpload directive, which will be an attribute directive we place on <body>. This is so the user can drag/drop the images anywhere on the page and everything will still work (note: the <body> height property must be set to 100% of the screen height for this all to work). Our directive doesn’t have an isolate scope, so we have access to the darkenBody method from MainCtrl’s scope (if you wanted multiple drag and drops into different areas of the page you should create one with isolate scope, but with this style there will only ever be one instance of the directive). Pretty cool and useful in my opinion. Hopefully your imagination is going crazy with possibilities in all sorts of directions right now, since this could be expanded to different types of content, including files from the user’s computer and so on. It’d benefit from a bit of animation and such as well. I wasn’t sure how Plunker/iframes would handle this, so I made a demo viewable on Github. I’m hotlinking the images here, but please don’t do this in production, it’s rude (upload them to your own server instead). This was a fun thing to learn how to do in AngularJS. Since this uses HTML5 APIs, it won’t work in older browsers, but I haven’t thoroughly tested it to see where it will work and where it will not (seems to go over well in Chrome, Safari, and Firefox on a variety of OSes). Ultimately it makes me excited for the future of Angular, the browser, and the NateWerk.